Micro-Mesh is a unique cushioned abrasive system with a very fine scratch pattern. 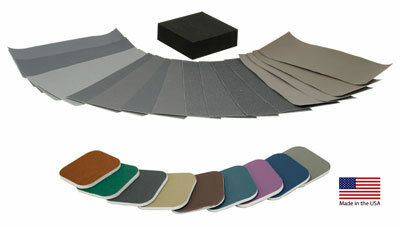 This cloth backed abrasive is very flexible and can be used wet or dry. This means after use it can be washed out for longer life. Micro Mesh works best when used with a foam block provide support for the abrasive. Micro-Mesh comes in 9 grits: 1500, 1800, 2400, 3200, 3600, 4000, 6000, 8000, and 12000. The 1,800 grit is equal to 800 grit in regular sandpaper. We offer a 1" x 3" x3" foam rubber block to be used for backing the Micro-Mesh. We offer Micro Mesh Pads that have 1/8" thick foam with abrasive on both sides. They are available in 2" by 2" and 3" x 4" sizes and are color coded. Now available are Micro-Mesh 2" and 3" Hook and Loop Discs in Variety Packs containing 9 grits ranging from 1,500 to 12,000.